In the wake of the Ironman Lake Tahoe cancellation, Jesse was determined to “redeem” himself by running another challenging race despite the race cancellation being out of his control. Although his Ironman 2015 plans have yet to be determined, we have running races on the docket that are sure to keep Jesse and me busy. While sipping some delicious Belgian ales and watching our new favorite show, the Good Wife, on Sunday, we began perusing races (marathons and ultras) held during the next six weeks and stumbled upon the trail Skyline to the Sea Marathon and 50K on October 11. 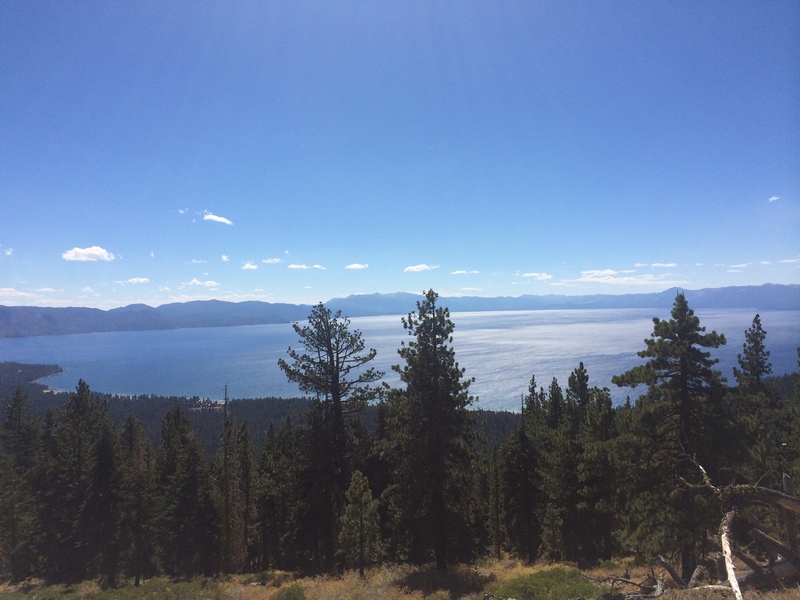 Hopefully Skyline to the Sea’s views are half as epic as this shot from the Tahoe Rim Trail. The Skyline to the Sea marathon is quite close to my hometown of Los Gatos and the views of the Santa Cruz mountains and the ocean are reputed to be breathtaking. With this marathon on the horizon, our October calendar is race-packed: The North Face Endurance Challenge Utah Half Marathon on October 5, Skyline to the Sea Marathon on October 11, a GGTC trail clinic on October 12, and Nike Women’s Half Marathon (for me, with Jesse volunteering as the lead cyclist) on October 19. Glorious downhill elevation for Skyline to the Sea. Although this race schedule may not seem like the smartest idea in the world, I plan on running all of these events “easy,” with my goal race being the North Face Endurance Challenge 50K. However, I definitely signed Jesse and I up for another race (in addition to the Mt. Tam Trail Run on November 15) – a Turkey Trot! The Silicon Valley Turkey Trot is the biggest turkey trot in the country, and I feel obliged to participate on Thanksgiving due to our proximity to this race in downtown San Jose. With lots of sleep, rest days, stretching and foam rolling, and massages, I’m convinced I’ll make it out of this stretch of races happy and healthy. That is a busy couple of months you have ahead of you! Sounds fun though! Good luck and stay healthy! I’m so sorry to hear about Ironman Lake Tahoe! That race schedule sounds like it will be a good distraction though. Good luck! That sounds like a totally crazy, and totally AWESOME schedule for autumn! That Skyline to the Sea race looks amazing, I love the Santa Cruz Mountains. The net downhill elevation looks like it might be pretty tough on the knees, though. Man, have a BLAST running around through fall. Take care of yourselves, and eat ALL of the carbohydrates. You’re so right – downhill hurts a lot on the quads and knees. Holy smokes what a fall schedule you guys have!! Have fun!! Thank you! And yes, let’s do it! Good luck to you! Either way, it will be beautiful! That elevation chart looks prickly!